Speedferries high speed ferry leaving Boulogne and heading for Dover. 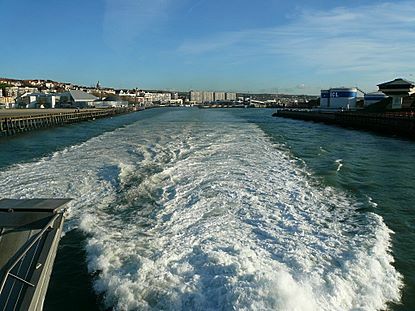 Several well-known ferry companies operate between England and the continent. Disembarking cars from the Shuttle, the Eurotunnel link between Folkestone and Calais. Practical info to help you make your choice about how to cross the English Channel. 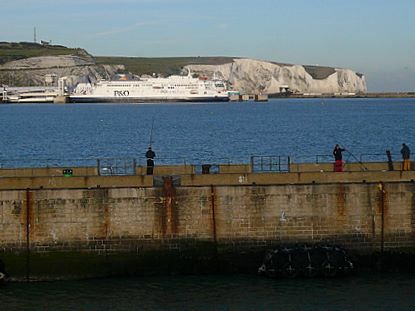 Dover to Boulogne: Cross the English Channel with Speedferries. Quick and cheap! 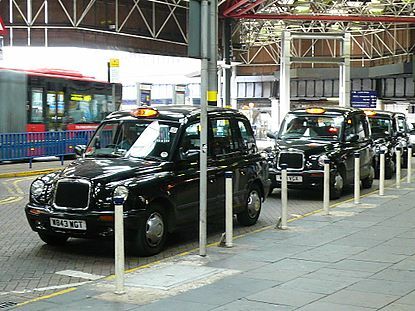 Crossing the Channel Tunnel by car with the Eurotunnel Shuttle, it is convenient and easy. 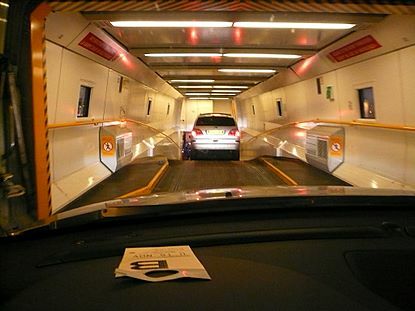 Hints and tips to travel from England to France through the Channel Tunnel with your car. Experience a train journey from Paris to London aboard the Eurostar high speed train. The Eurostar to Paris or Brussels departs from the St Pancras station in London. Discover the new Eurostar international train station in London!